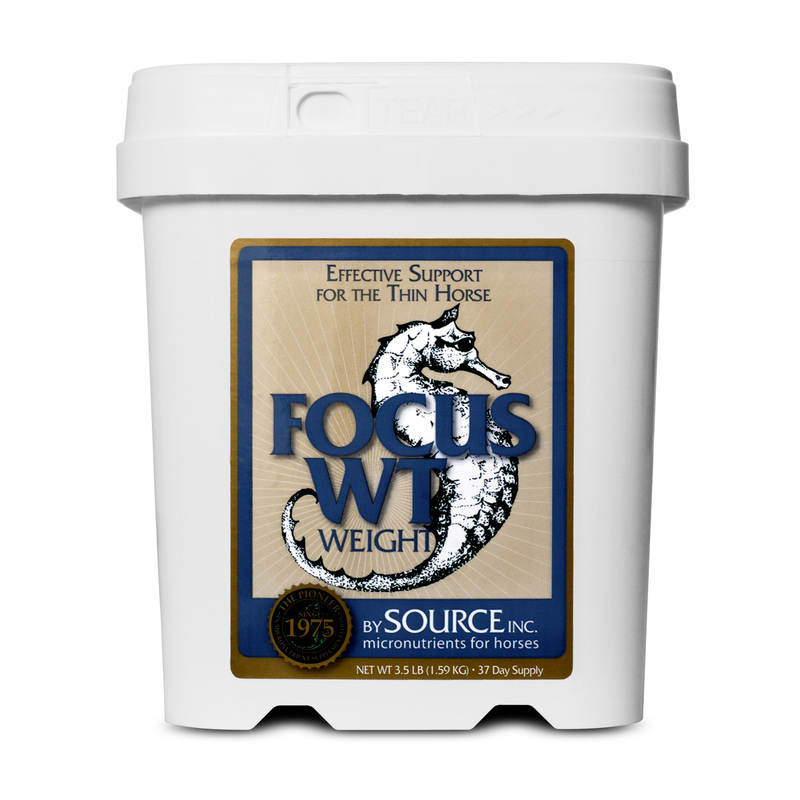 Certain horses seem to need more than good feed management and parasite control to gain weight or maintain it under stress. Providing extra calories may not be enough. FOCUS WT provides a unique formulation of broad spectrum support nutrients including nutritional yeast culture, enzymes, beneficial microbes, B-complex vitamins and chelated trace minerals . . .
. . . and includes the legendary SOURCE® micronutrients to make it all work! 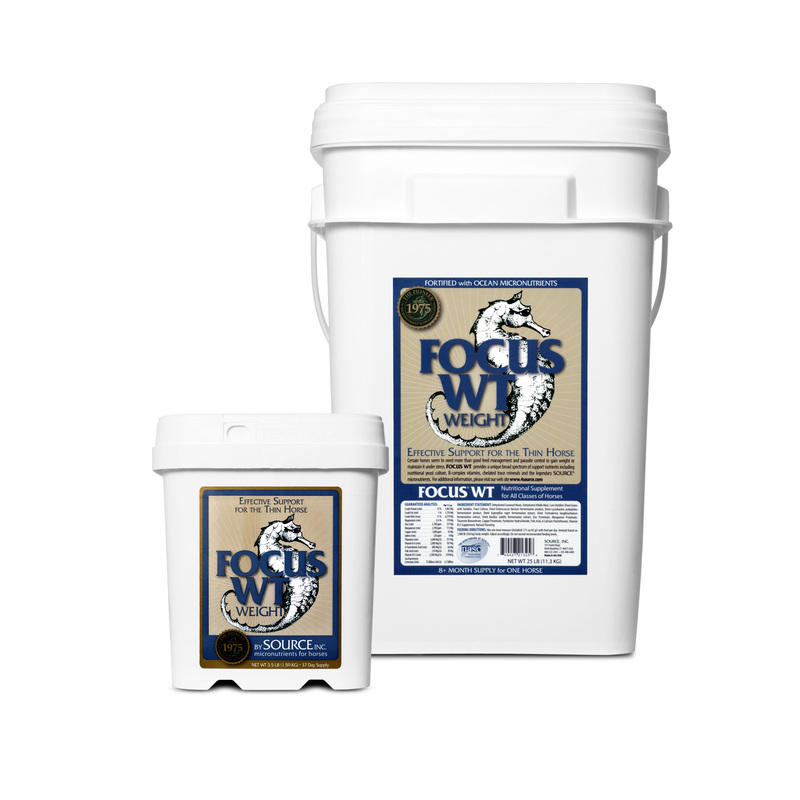 Feed FOCUS WT everyday, including race and competition days. 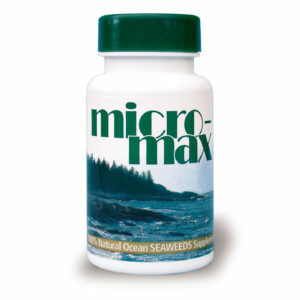 Mix one level measure (included in the container) ( 1.5 oz. )(42 gr.) 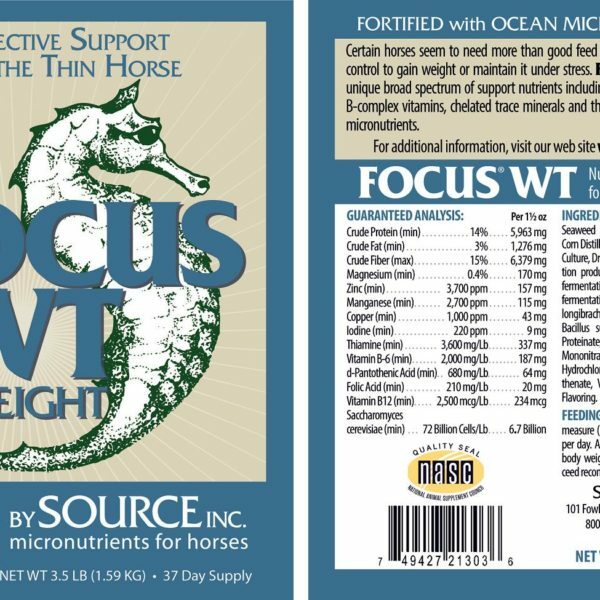 of FOCUS WT with feed per day. Amount based on 1,000 lb. (450 kg) body weight. Adjust acordingly. 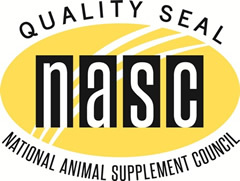 Do not exceed recommended feeding levels. 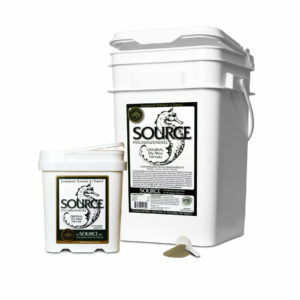 SOURCE is a rich source of natural organic iodine. It is particularly useful for those who are seeking to increase iodine levels in a potentially deficient ration. But caution? even a good thing can be overdone. SOURCE should not be fed at higher than recommended dosage levels, and if you are supplementing with a number of different products, it would be wise to review iodine levels to assure you are not overdoing it. 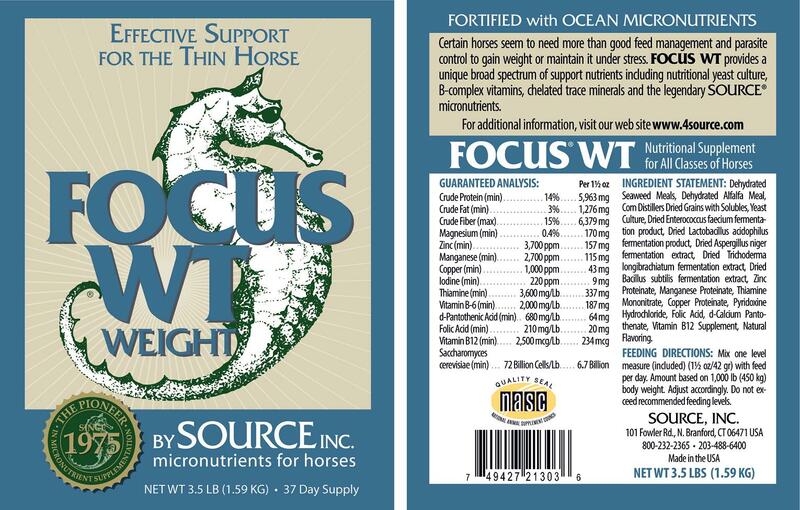 A daily serving of FOCUS WT contains 9 mg. of naturally occurring organic iodine. 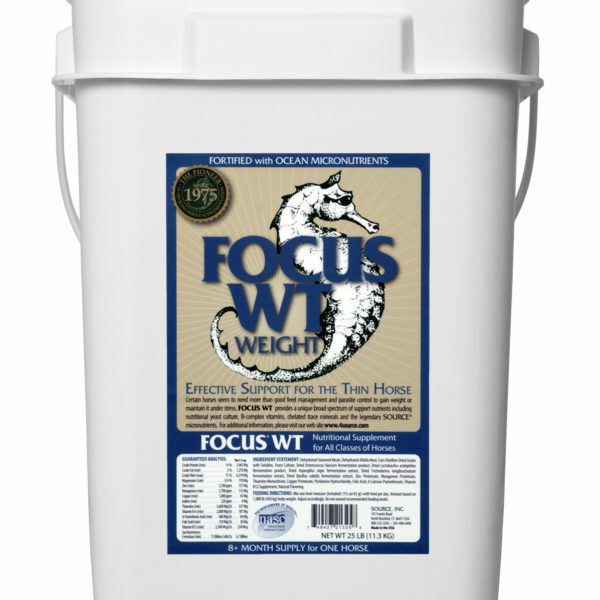 We want you to have the opportunity to see for yourself the effectiveness of FOCUS WT – risk free. If you are not satisfied, your money will be refunded in full – no strings attached. Simply enclose proof of purchase. There is no time limit on this guarantee. 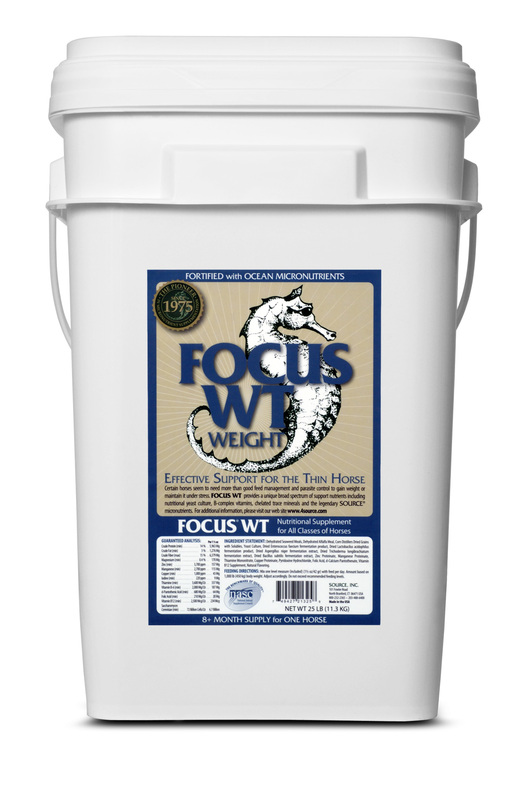 FOCUS WT is available for your horse in a convenient 3.5 lb. size which will last one horse for 37 days. 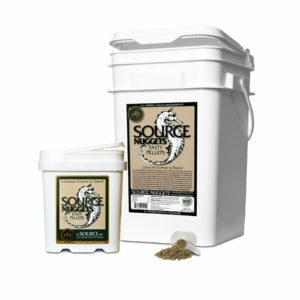 It is also available in an economical, 25 lb. easy-open container (lasts one horse for 8 months).